Astrobiology is a young and vibrant field of research, incorporating knowledge from across the whole spectrum of science and combining it to gain a better understanding of our place in the Universe. Astrobiology – A Brief Introduction is an enjoyable and interesting summary of astrobiological research, history, and aims. It captures the youthful vitality of the field and explores the astonishingly diverse array of subjects that provide information on life and its beginnings. 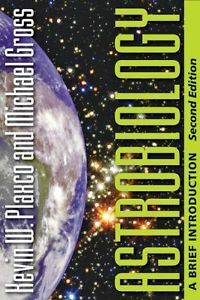 The authors, biochemists Kevin Plaxco and Michael Gross, have produced a well structured and clearly written book that aims to convince the reader that ‘astrobiology has a subject matter to study’. Key features of astrobiological research are explained, followed by a detailed account of how life is thought to have arisen on Earth. Habitability of planetary systems is a significant early theme, and a detailed chemistry-orientated discussion on how molecular life on Earth could have begun is what marks the book out from the competition. The fascinating world of extremophiles is well presented, and a broad overview of the searches for evidence of life beyond Earth rounds off the book. The text is liberally illustrated with relevant figures that greatly enhance the content, and entertaining snippets of information detailing the quirks of research in this field nicely supplement the scientific content. The book is pitched towards a general scientific audience, but a suitable glossary may be all that is necessary to broaden its appeal to a wider readership, as several unexplained scientific terms are used. It contains a substantial index, and gives a range of suggested further reading texts suitable for all levels of interest (although this could be expanded). The use of sidebars ‘weighing the probabilities’ for life’s evolution keeps a common thread running through the book, and the well structured chapters begin and end by discussing some of the important people and events that have shaped astrobiology to date. Complex subject matter such as the molecular chemistry on which terrestrial life is based is clearly, though not concisely, explained, but overall I found the text engaging and fluent, and it has certainly provided new ideas for my own research. For its target audience, the book does exactly what its authors intended – introducing astrobiology and bringing the reader up to speed with the main areas of research within the subject. The information is presented in an approachable fashion, and I for one have been convinced that astrobiology has a unique, and extremely exciting, subject matter to study. The Big Bang physical variables at different stages, the formation of different substances to determine the biological evolution of the meaning of biological livable different range and accurate livable zone.